Here’s a free tool that can help you in understanding what users click on your webpage. 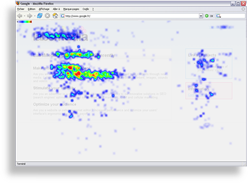 ClickHeat is a visual heatmap of clicks on a HTML page, showing hot and cold click zones. And since it’s free, you get to host it on your own server and keep all of the recorded data. – Screen sizes and browsers are logged, making possible the tracking of liquid CSS layouts (100% used width). Tips: Sounds good to be used with split testing your landing pages.